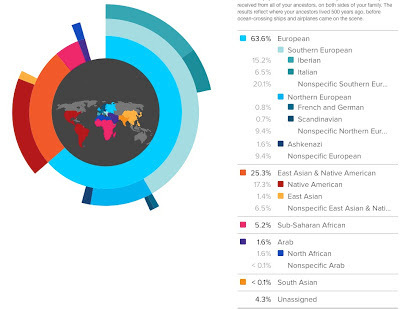 Your Genetic Genealogist: 23andMe's New Ancestry Painting - First Look! 23andMe's long awaited Ancestry Painting 2 (now called Ancestry Composition) is finally here. I am extremely pleased with my results and those of my family. The results are presented as a ring chart with settings for different confidence levels and regional detail. The easiest way to figure out how it works is to just click around, trying the different options. To inspect more closely, click on any of my images to enlarge. I vastly prefer the "Speculative" setting since it seems to fit very well with what I know of my ancestral origins. The pie chart below reflects my known ancestry. It was created from an Excel spreadsheet made by John Tierney and available on his blog. It appears that perhaps I do have some African ancestors after all (in a relatively recent time frame)! My brother-in-law's ancestry becomes even clearer with the new Ancestry Painting. The small amount of Asian disappeared and was replaced with an increased African component. From what I've seen during beta testing, this appears to be the case with many of those with African American ancestry. I am happy to report that, although we did not get a chance to beta test this portion of the new feature, the chromosome painting, including the X chromosome, is now live. *Note that the paternal and maternal chromosome orientation is not always consistent in placement (top versus bottom) in this chart. 23andMe uses their own customized version of a phasing engine called BEAGLE to separate out the genetic components inherited from each of our parents, even without actually testing them. However, if you have a parent or child in the 23andMe database, then your phasing will be improved. This will lead to more accurate assignments as well as more detail contained in your ancestral breakdown (i.e. Italian versus Unspecified Southern European). Therefore, if you are fortunate enough to have tested one of these close family members, you need to let 23andMe know about this by connecting their profiles to your Family Tree. If you have at least one of your parents in the 23andMe database (and connected to your tree), then you get a third view called "Split View". This view will automatically show you which parent contributed which portions of your ancestry. The new Ancestry Composition is expected to continue to change and improve as 23andMe builds their database. As you can see, this is especially important for African Americans. In the announcement on the forum, 23andMe geneticist and Product Manager Mike Macpherson acknowledges, "But there’s still more to do. One important example of this is that the system is designed to be able to update the reference populations. As it is now, Ancestry Composition can dive into European ancestry, but it offers limited resolution into East Asia and Africa. We’re working now on an update that will split up the Eastern Asian and Sub-Saharan African populations." The 23andMe white paper explaining how this new feature works tells us just how far they have come, "We compiled a set of 7,868 people with known ancestry, from within 23andMe and from public sources. That’s over 15,000 chromosomes, since every individual contributes a chromosome from both their mother and their father. This a big jump over the 210 individuals that powered our original Ancestry Painting feature." The paper further tells us that the public reference datasets that make up the "Public" numbers that you see above, include the Human Genome Diversity Project, HapMap, and the 1000 Genomes Project. It goes on to explain, "Populations may be inherently difficult to distinguish because of historical mixing, or we might not have had enough data to tell them apart. As we obtain more data, populations will become easier to distinguish." At least for me, this is a very good start! In fact, I think this just might be the best admixture tool I have tried so far. What do you think? I think this very well could be the best tool I've seen. I love how you can dig in and pull out and also how you can choose your level of "confidence". Very impressive indeed. There is definitely a lot of features. It is a highly interesting tool. I'll have fun playing around with it. I hadn't heard before that it uses phased results, or that results are improved if you "tell" 23andMe about all parents /children that have been tested. The Ancestry Composition tool is great. THANKS, 23andMe! Now I have to ask, WHY did I need CeCe to point this white paper out for me? Why isn't there a link to it right there on the Ancestry Composition page? It's possible that it's actually linked there and I just can't find it, but I don't think that's the case. Actually Mike Macpherson is the one who pointed it out in his post introducing Ancestry Composition today. It's there, but not obvious. There's a question mark icon on the AC page. When you click on it, a couple of references, including the white paper, are presented for viewing. I'm a little confused. Why do these results make Europeans appear to be a less homogeneous group than other ethnic groups, when studies have shown that the opposite is in fact true? Why are sub-Saharan Africans and Asians lumped together in very broad categories, when in those areas, especially Africa, there is the greatest genetic diversity? I understand that they are a company and their customers are mostly European descendants, but it would be a very easy thing to infer misleading conclusions about one's ancestry due to the way this information is presented. Furthermore, we ALL have African ancestors. There is not one human alive who is not related to another human being. I understand you mean RECENT ancestry, but again we must be careful how this sensitive information is presented. Good points. 23andMe recognizes the deficiency in this area and has publicly stated that they plan to address it soon. @Anonymous I believe the answer for now is that it is due to the data available to 23andme. They have far more customers who are of European heritage than anything else. Once they build up the data points for the other populations, they will be broken out on a more detailed level as well. Any word on whether or not they (or anyone) plan to sub-divide the Ashkenazi category? That's pretty much all I got. Or is such a subdivision even possible post 20th Century? Not that I have heard of, but that would certainly be interesting! Decode me makes the mistake in my opinion of assigning ancestry based on the frequency with a genetic marker is founds within that population. I HOPE 23andMe DOESN'T MAKE THIS MISTAKE IN THEIR UDPATED ANCESTRY ANALYSIS. In other words, just because someone has genetic markers that occur in, say, 10% of Africans, and also occurs in 90% of Europeans, doesn't mean that they should be classified as 10% African and 90% European. If you are European in origin, then in all likelihood, that marker came from Europe, not Africa or Asia. To assign a percentage to African or Asian is simply a jump I wouldn't be willing to make as it incorrectly assigns a racial component that is false (and potentially false by a large amount). My on;y complaint is that 23andme didn't tell me about it, but thankfully I read your blog and you did! Love the new info and its presentation by 23andme! My autosomal DNA results are very confusing. They show 23% Ashkenazi heritage, and I have 830 matches on FTDNA. I have no Jewish ancestry that I know of and have a family tree that goes back to the 1500 and 1600s. According to people I have spoken to, I should have 1 grandparent who is Jewish but I don't know who that would be. None of the names that others are researching are familiar at all except for 1 person with whom I match with the surname Benjamin. What do I do with this information? I was adopted but found my birth family. My brother has tested his DNA but only the Y-DNA. We don't know who our father's father was as his mother was not married when he was born. What would you suggest I do to try to unravel this mystery? I don't know all of your story, but I will address your questions best that I can. It sounds as if you definitely have Ashkenazi heritage. Does your brother have a matches on his Y-DNA test with Ashkenazi heritage? If so, then it is your father's father that gave you your Jewish ancestry, which fits very well with your findings on Family Finder. It sounds like the majority of your matches are from that unknown grandfather, so there is good reason that you don't recognize the surnames. Do you have the surname Benjamin in your known family tree? If so, that certainly would suggest that there is Jewish ancestry from another line as well. I would also test your brother on Family Finder to make sure that you are full siblings and don't have different fathers. Thanks for your comment. You can write to me privately if you wish. By the numbers, you may have one Jewish grandparent, this is true. Someone who hid their identity or converted so young they don't know. Perhaps even a child who escaped the Holocaust by living with a non-Jewish family. Another possibility is that two of your great grandparents converted (or hid their identity) and married each other because they had that in common (or converted together), etc. But yes, the unknown grandparent, is the place to start. I have spent the whole morning perusing your website that I found while trying to find a review of 23 and me. I have been researhing my family for 15 years now so I am not new to genealogy but am so confused with the DNA component and hope that you can provide some answers - please forgive my ignorance! Since I am female so I have no y chromosome so do I miss out on my father's whole family history? I was originally going to order a kit for myself and my huusband (although he doesn't really want to :) ) but now that I read your "split screen" talk above would I be better off ordering one for me and my 7 year old son? This way I would get my information on my report and connect it to my son and then I could see what information he received from me and what he received from his father's line and any new information on my line would then be obviously from my father? I hope that made some sense - it is still early in the morning. Everyone receives 50% of their autosomal DNA from each parent, so half of your ancestry is from your dad regardless of the fact that you don't have a Y-Chromosome. (23andMe tests autosomal DNA.) Your son will not inherit any DNA from your father that you don't pass to him, therefore testing him is less beneficial than testing his father unless you just want to see the 50% that your son inherited from you. If your husband doesn't want to test, then testing your son will show you the half of your husband's DNA that your son inherited. Thank you so much for your reply and actually it made a lot of sense :)!! I think the autosomal DNA is where I was confused but slowly but surely I am getting it. Happy Holidays to you and yours!!! Just started playing with this tonight. Really fun results. I'm a little less Finnish than expected, too. My mom's very nearly 50 percent Finnish on her chart and I'm only like 18 percent. I'm a little more than half as Scandinavian as my mom. So guess that's how those things shake out. I've tried to get my siblings to test and one is less enthused because of the spitting and one because of the cost. Hopefully highlighting the recent coolness and the price drop will get them invested. These charts are just TOO cool! I am curious about the accuracy of this new feature. I am a genetics graduate student, and thus am really interested in my own genetic history. Here is the thing, this Ancestry composition application said I was 0.4% Sub-Saharan African. I got quite excited about this as it runs contrary to all the family history I have been given. The split view showed that all of this would have come from my mother. This was when I only had my father's genotype (0.0% African). Well today I got my mothers information and it says she is 0.3% sub-Saharan African. Obviously both of these results can't be true (I can't be 0.4% African if my mother is 0.3% and my father is 0.0%). At first I was pretty dubious about the African heritage at all. Do you know how likely it is that all of my African heritage is an error or how likely it is that it is real?